Case of 6 - 5 lb. Bottles. Gunter's golden honey is a blend of honey giving a rich taste with a medium color. It is honey that Winnie the Pooh would love. Use it as a general use honey. Great on cereal and oatmeal. Coffee or tea. Salad dressings and in cooking or baking. 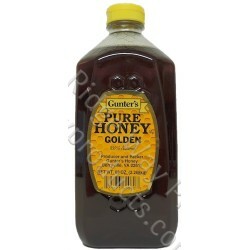 Gunter's Golden Honey - 5 lb.